This book is a prequel to High Country, Mr. Wyman’s acclaimed first novel, providing the backstory to High Country’s main character, Ty Hardin. People who have read the original book will welcome the new one to fill in any holes and enjoy another round with much-loved characters; people who start with Blue Heaven will have a similar book to move on to and enjoy for the same reasons. It’s important to understand this, because Blue Heaven isn’t really a stand-alone novel—it’s part of a continuing story, though you can read it without ever seeing the other book and understand who’s who and what’s going on. 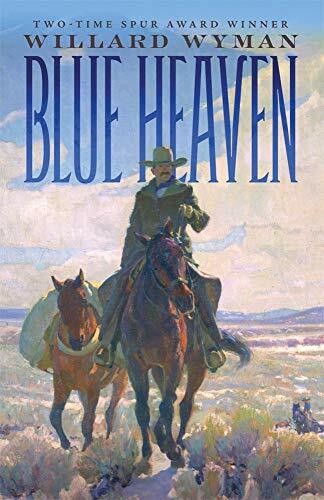 Blue Heaven covers the life of Ty’s mentor, Fenton Pardee, who founds the pack-trip business Ty sustains in High Country. Blue Heaven focuses on Fenton and his wife, Cody Jo, each of whom gets their own viewpoint section—followed by Ty as a sort of caboose to Fenton’s and Cody Jo’s train, allowing readers to transition seamlessly into the original book should they choose. Although Western in subject and flavor (and cover art), Blue Heaven isn’t about the Wild West. Those days have already gone by when the story opens, so it’s more about the transition into the 20th century, when the American West was an island surrounded by the rapidly developing industrial age. The book opens with the symbolic death of the West’s icon, Buffalo Bill Cody, in a train wreck that sets Fenton Pardee, a worker in Cody’s Wild West show, on his quest to find a meaningful life for himself in the back country. “Blue Heaven” is what he finds—not a particular place, but a region and lifestyle that set his heart on fire and break it at the same time. The book does the same to the reader, who is left hungering to know more, to feel more, to share more of the characters’ lives in the magnificent and inspiring—and brutal—country. Unfortunately, Mr. Wyman is a “tell” kind of writer instead of a “show” kind, so that the reader may feel like a spectator viewing a painting or an epic film instead of a participant in the story. While Mr. Wyman realistically evokes the Montana mountains and the paradox of living among them (hardship and suffering in paradise), his characters are more archetypes than individuals, the kinds of people that most of us believe settled the West and made it great. A characteristic they all seem to share is keeping their feelings to themselves; and, when they do talk, it comes out remarkably lucid and philosophical for folks who lack conventional schooling. They all sound rather the same, as well. This is what creates the hunger for more, because despite any narrative shortcomings, everybody is so interesting, and their lives are so heroic and romantic, that we want to know what it was really like in greater depth. Yet Mr. Wyman keeps even the timeline vague. Only one date is mentioned throughout the book, at the very beginning: 1902, the title of the first chapter. Its description of the Cody train wreck suggests a historical fiction novel to follow, but the date and place are wrong for the event according to other material. The book goes on to cover several decades, with the only clues to time passage being jumps from season to season and occasional mention of national events, like the Depression and the World Wars, to place the story in history. Mr. Wyman covers this in his front note: “This book is about Fenton Pardee. You won’t know about him unless you’ve read a book called High Country. That book was about Ty Hardin, who shows up in this book, too. What that book says is true, mostly. So are the things in this book. But some of the same things happen in both books, and they might seem a little different. “But that’s nothing. Everything’s a little different if you look at it one way—then take another look from someplace else. “The important thing is that both books are mostly true and that one truth was just as hard to write as the other. Well, yes. And that’s the sensation left by Blue Heaven: It’s mostly true. But the truth it presents is compelling, and the characters—both place and people—are worth knowing. Just as it was hard for Mr. Wyman to write one book and the other, it’s difficult for the reader to put down one book without wanting to pick up the other one . . . a paradox similar to the life both books describe.